When governments dispense privileges to particular firms, businessmen and women learn to play politics. They lobby, campaign, and engage in other political activity in order to obtain and maintain privileges. Economists call this rent-seeking. Because these activities are of little or no social value, rent-seeking is socially wasteful. It is estimated that in any given year, somewhere between $1 and $3.5 trillion in national output is wasted in rent-seeking. Large though these costs are, they actually understate the problem with government-granted privilege. That’s because privileges do not simply waste resources at a particular point in time, they also slow the growth of an economy over time. And changes in growth rates add up over time. Think of a healthy economy in which firms compete on a level playing field. In such an economy, entrepreneurs busy themselves creating new products and services, new production techniques, and new ways of creating value for customers. But now consider a sick economy, one that has succumbed to the pathology of privilege. In this economy, entrepreneurs busy themselves in what economist William Baumol has called “unproductive entrepreneurship.” Instead of devising new ways to create value for customers, they devise new ways to obtain government-granted privileges: new legal gambits to hobble their competitors, new regulations that will help them secure market share, new ways to ingratiate themselves to politicians handing out favors. Two decades ago, economists Kevin Murphy, Andrei Shleifer, and Robert Vishny studied this phenomenon using data from dozens of countries. As a proxy for productive entrepreneurship, they examined the share of students in each country concentrating in engineering. And as a proxy for unproductive entrepreneurship, they examined the share of students concentrating in law. After controlling for other factors, they found that a 10 percentage point increase in the share of students concentrating in law was associated with 0.78 percentage point slower annual growth in per capita GDP. Economic growth was slower in countries where there seemed to be more rent-seeking. In my chart this week I put their finding in context. If, since 1980, U.S. per capita GDP had grown 0.78 percentage points faster than it actually did, then 2011 per capita production would have been $54,000 rather than $43,000. 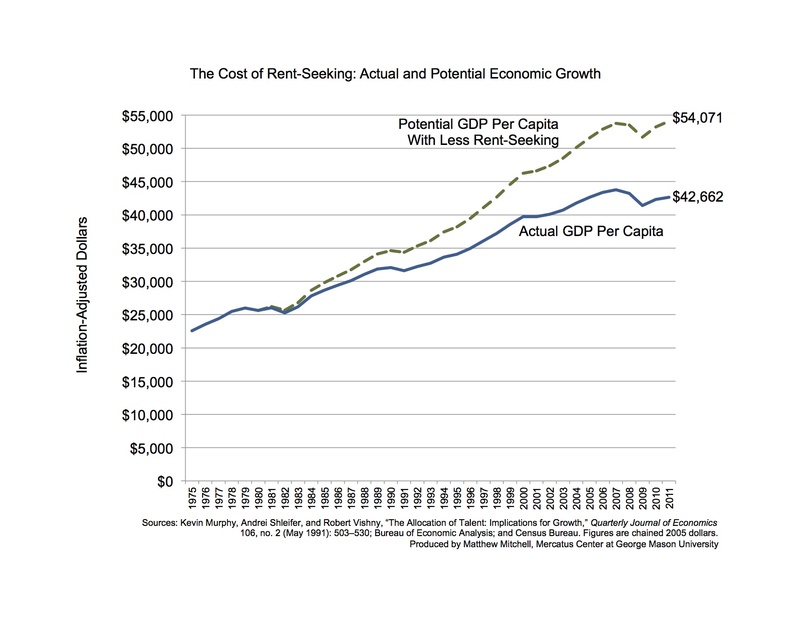 Since compensation is highly correlated with productivity, this means that Americans could be making thousands of dollars more per year were it not for rent seeking. Up to a certain point, lawyers are theoretically good for growth; they help delineate and define property rights and they help maintain the rule of law. But beyond some minimum point, more lawyers may lead to more rent-seeking. Even if lawyers themselves are not the cause of rent seeking, they may be an indication of it. In the same way that a large number of police per capita may be an indication of a city’s inherent violence, a large number of lawyers per capita may be an indication of a nation’s tendency to rent-seek. This entry was posted in Crony Capitalism, Economic Growth and tagged Andrei Shleifer, economy, GDP, growth, Kevin Murphy, Robert Vishny, William Baumol on July 23, 2012 by Matt Mitchell.